Dr. Predrag Matejić, the curator of the Hilandar Collection at Ohio State University, delivers the third annual Fr. John Meyendorff Memorial Lecture. Metropolitan Tikhon of the OCA and Metropolitan Joseph of the Antiochian Orthodox Christian Archdiocese were also given honorary doctor of divinity degrees at the convocation. From Constantinople we go to the Church in Kiev and Rus from the 10th to the 13th Centuries. Fr. 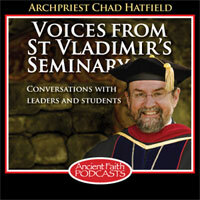 Tom reflects on the very important 10th Century (the 900's) and the conversion of Prince Vladimir.